Universal Leg Length Shims (LL Shims) are used to compensate for leg length discrepancies with Time Road, Shimano SL, and/or Look Delta cleats. Universal Leg Length Shims (LL Shims) are used to compensate for leg length discrepancies with Time Road, Shimano SL, and/or Look Delta cleats. Our 3 mm LL Shim is made of high-density plastic to conform to the curve of the sole of the shoe. 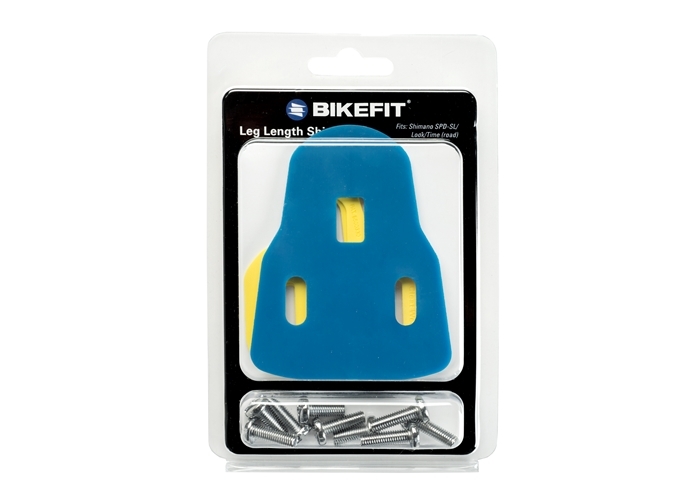 Package includes one (1) Universal Leg Length Shim, three (3) 12 mm, three (3) 14 mm, three (3) 16 mm screws and two (2) Look Cleat Wedges (which can be "stacked" to create an additional 1 mm of height). Multiple Universal LL Shims (sold separately) may be used together. Note: If you plan on stacking 2 or more LLS, please contact us for extended screws.